Their next machine seems to be almost the same but incorporates a pressure gage. The specs are the same but the pressure gage seems to make that unit $267 more expensive. Their TANCS disinfection system is an additional upgrade. Stepping up to their next machine, you will get more pressure at 80 PSI, the same non steel pressure gage, a higher wattage heater at 1700, a bigger boiler at 2.0 liters (2.2 quarts). TANCS is still an option. The hose is still rather short at 6.5 feet. But you do get the tool storage built in. That price is $1706. This is still without their TANCS disinfection. Are you confused? We sure are. They lay out their machine well on their website but it’s kind of confusing picking a model you may like and what feature may work best and what price range you may be in. 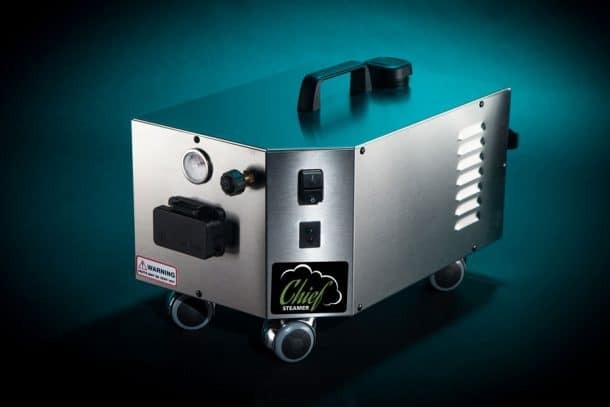 In a Chief Steamer refill 100 as by now you know the heater is EXTERNAL. So we do not worry about having disinfection system that eliminates calcium in the boiler and on the heater. We keep it external and have a drain plug on the boiler. We feel this is sufficient.